Randolph's output, however, ranged wider than this: he illustrated novels and accounts of foreign travel; he made humorous drawings depicting hunting and fashionable life; he drew cartoons and he made sketches of the famous inside Parliament and out of it; he also exhibited sculptures and paintings in oil and watercolour in the Royal Academy and galleries. Randolph was born in Chester on 22 March 1846 at 150 Bridge Street (now No 16) where today there is a plaque to commemorate him. His father, John Caldecott, was a Chester business man and an accountant of some note who was married twice and had 13 children. Randolph was his third child by his first wife Mary Dinah (née Brookes). In 1848 the family moved to Challoner House, Crook Street and in 1860 to 23 Richmond Place at Boughton just outside Chester. He spent the last five years of his schooling at The King's School which, in those days, was in the cathedral buildings in the centre of the city. In his early childhood Randolph drew and modelled, mostly animals, and he continued drawing for the rest of his life. There is a small oil painting in Chester of his brother Alfred painted during his school days. On leaving school at the age of fifteen, Randolph went to work at the Whitchurch branch of the Whitchurch & Ellesmere Bank and took lodgings at Wirswall, a village near the town. In his spare time and when he was out visiting clients he was often to be seen walking and riding around the countryside; many of his later illustrations incorporate buildings and scenery of that part of Cheshire. His love of riding led him to take up hunting and his experiences in the hunting field and his love of animals bore fruit over the years in the masses of drawings and sketches of hunting scenes, many of them humorous. 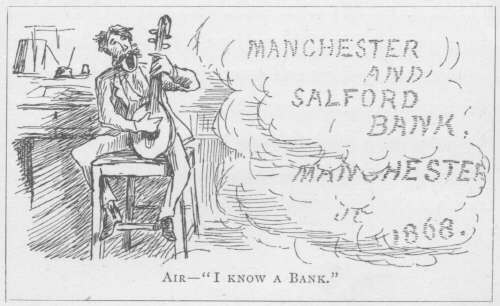 In the year that he left school, 1861, he first had a drawing published: it was a sketch of a disastrous fire at the Queen Railway Hotel in Chester and it appeared in the Illustrated London News together with his account of the blaze. After six years at Whitchurch, Randolph moved to the head office in Manchester of the Manchester & Salford Bank. He lodged variously in Aberdeen Street, Rusholme Grove and at Bowdon. He took the opportunity to study at night school at the Manchester School of Art and practised continually, with success in local papers and some London publications. It was a habit of his at this time, which he maintained all his life, to decorate his letters, papers and documents of all descriptions with marginal sketches to illustrate the content or provided amusement. (The one shown below is from a letter to his sister Sophia, the day after his birthday.) A number of his letters have been reprinted with their illustrations in Yours Pictorially, a book edited by Michael Hutchings. In 1870 through a friend in London, the painter Thomas Armstrong, Randolph was put in touch with Henry Blackburn the editor of London Society, who published a number of his drawings in several issues of the monthly magazine. Encouraged by this evidence of his ability to support himself by his art, Randolph decided to quit his job and move to London; this he did in 1872 at the age of 26. Within two years he had become a successful magazine illustrator working on commission. His work included individual sketches, illustrations of other articles and a series of illustrations of a holiday which he and Henry Blackburn took in the Hartz Mountains in Germany. The latter became the first of a number of such series. He remained in London for seven years, spending most of them in lodgings at 46 Great Russell Street just opposite the British Museum, in the heart of Bloomsbury. While there he met and made friends (as he did very readily) with many artistic and literary people, among them Rosetti, George du Maurier (who was a fellow contributor to Punch), Millais and Leighton. His friendship with Frederick (later Lord) Leighton led to a commission to design peacock capitals for four columns in the Arab room at Leighton's rather exotic home, Leighton House in Kensington. (Walter Crane designed a tiled peacock frieze for the same room). In 1869 Randolph had a picture hung in the Royal Manchester Institute and he was hung in the Royal Academy for the first time in 1876. He was also a water colourist and was elected to the Royal Institute of Watercolour Painting in 1872. In 1877 Edmund Evans, who was a colour printer and talented engraver, lost the services of Walter Crane as his children's book illustrator and asked Randolph to do illustrations for two books for Christmas. The results were The House that Jack Built and The Diverting History of John Gilpin, published in 1878. They were an immediate success; so much so that he produced two more each year until he died. The stories and rhymes were all of Randolph's choosing and in some cases were written or added to by himself. In another milieu Randolph followed The Hartz Mountains with illustrations for two books of Washington Irving's, three for Juliana Ewing, another of Henry Blackburn's, one for Captain Marryatt and for other authors. Among well known admirers of his work were Gaugin and Van Gogh. People who like being shewn over princely mansions would probably also like to stare at their noble owners. Money might be made by this suggestion." In 1879 he moved to Wybournes, a house which he took (it is not known whether he bought or rented it) near Kemsing in Kent. It is there that he became engaged to Marian Brind, who lived at Chelsfield about seven miles away. They were married in 1880 and lived at Wybournes for the next two years. There were no children of the marriage. In the autumn of 1882 the Caldecotts left Kent and bought a house, Broomfield, at Frensham in Surrey; they also rented No 24 Holland Street, Kensington. By 1884, sales of Randolph's Nursery Rhymes had reached 867,000 copies (of twelve books) and he was internationally famous. However, his health was generally very poor and he suffered much from gastritis and a heart condition going back to an illness in his childhood. It was his health among other things which prompted his many winter trips to the Mediterranean and other warm climates. It was on such a tour in the United States of America that he was taken ill again and succumbed. He and Marian had sailed to New York and travelled down the East Coast; they reached Florida in an unusually cold February; Randolph was taken ill and died at St. Augustine on the 12th Feb 1886. He was not quite 40 years old. A headstone still marks his grave in the cemetery there. Soon after his early death, his many friends contributed to a Memorial to him which was designed by Sir Alfred Gilbert. It was placed in the Crypt of St. Paul's Cathedral, London. For more about this, click here.